What to do with leftover fish. This was a problem in our house for quite some time, we would have leftover fish, I would refrigerate it for a day or two, no one would eat it and then it got thrown out. So I went on a hunt for what I could make with the leftover fish, and I found this recipe. These fish cakes are so good, that we now intentionally cook extra fish so that we can make these fishcakes. I have been making the same recipe for quite a few years now, with no interest in looking for another recipe, I love this one. The ingredients are so simple, yet when put together they make these great fishcakes. The mixture is quite soft, so you need to be a little careful with them, but they are really good. You can make them flat or roll them into balls, doesn't matter really. I like it served with some homemade Tartare sauce. It doesn't matter how the fish was initially cooked, whether it was BBQ, fried, baked or poached. What you do need to do though is when you first eat the fish, you need to remove the skin and take out the bones out of any leftovers after your meal, as trying to get skin and bones out of fridge cold fish is quite a challenge. I am happy to say there is no longer thrown out leftover fish at our house. Roughly mash cooked potato, cool. Ensure skin and bones have been removed from the fish, flake the fish. In a medium sized bowl add the potatoes, fish, mayonnaise, parsley, egg yolk, onion, salt and pepper. Mix to combine, refrigerate for 30 minutes. Place egg and milk in a bowl, beat together with a fork. Place the flour in another bowl and the breadcrumbs in a third bowl. Using wet hands shape the fish mixture into medium sized patties, gently press them together, or they will fall apart. Place on a plate, repeat with the remaining mixture. Refrigerate for 30 minutes. Lightly coat a patty with the flour, place it into the egg mixture and coat it with the egg. Then carefully coat it in the breadcrumbs. Heat oil in a frying pan, you want the oil to be 1/2-1cm deep. 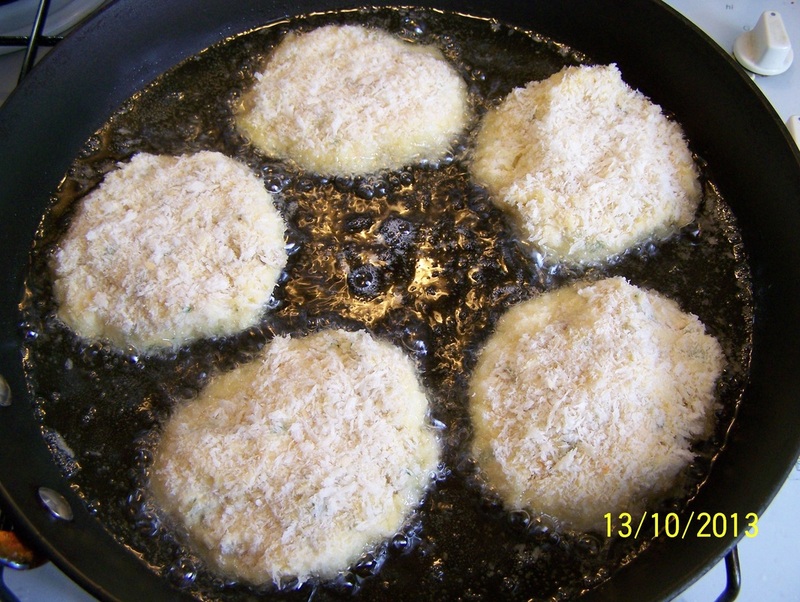 Cook the patties over medium heat for a few minutes on each side, or until golden brown and heated through. Serve immediately with tartare sauce and a green salad.